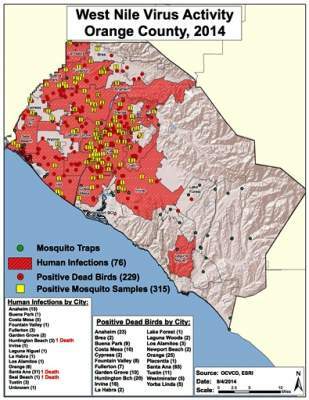 SANTA ANA, CA (September 5, 2014) – Orange County is currently experiencing the highest level of West Nile virus infection in mosquitoes ever recorded in the county. West Nile virus is transmitted through the bite of an infected mosquito. Infection can cause severe illness and permanent disabilities, and in rare cases, can result in death. 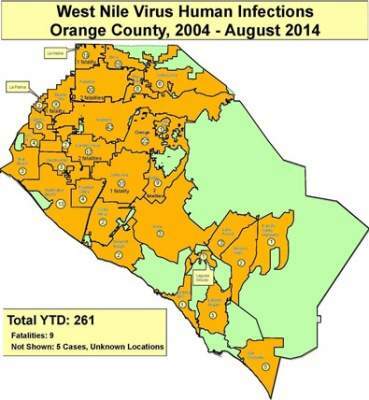 Despite collaborative efforts with the Orange County Vector Control District to reduce mosquito-breeding sources, expand education to residents, conduct aerial surveillance for out-of-service swimming pools, and intensifying immature mosquito control, the rate of infection in both mosquitoes and birds remains abnormally high. Due to these factors, the Orange County Vector Control District (OCVCD) will conduct truck-mounted mosquito control treatments in strategic locations in the City of Santa Ana. Residents in the area of application will receive information about the applications from the City of Santa Ana and OCVCD. To avoid traffic and outdoor pedestrian activity the District will conduct treatments in the pre-dawn/dawn hours of September 8-11, 2014 between 3:00 am and approximately 5:00 am. Treatment may be rescheduled if weather conditions are not favorable for an effective treatment. The product, AquaANVILTM (US EPA REG. NO. 1021-1807-8329) is registered with the EPA and is applied by trained, state-certified technicians. OCVCD has used truck-mounted foggers for decades in wetlands and open spaces to control adult mosquitoes throughout the county. Any scheduled treatment may be postponed, cancelled or rescheduled due to unfavorable weather conditions and/or other reasons. Eliminate any standing water around your house. Avoid runoff from overwatering lawns and washing vehicles. Make sure all of the window and door screens on your house are in good repair. Wear a repellent containing DEET®, Picaridin, Oil of Lemon Eucalyptus, or IR 3535. Contact the Orange County Vector Control District to report biting mosquitoes, dead birds or neglected pools. For questions on West Nile Virus or this treatment, please contact Vector Control: (714) 971-2421 or (949) 654-2421 www.ocvcd.org.